What does a swimmer do when she’s never lost an individual dual race in two high school seasons and already broken multiple district records before her junior year? What is she competing against? What’s next? “I kind of just race against McNary’s records,” said Kuch who owns the school records in the 100, 200 and 500 freestyle. Kuch, who also has the Greater Valley Conference record in the 100 and 200 free and was named Female Swimmer of the Year last season, won’t likely be tested until the state meet. She placed fifth in the 100 free and eighth in the 200 free there last season, marks she would like to improve on. “This year I have really high goals of placing top five or top three in the 200 free and the same with the 100 free,” said Kuch, who would also like to lead the Lady Celts’ 200 free and 200 medley relays to state. 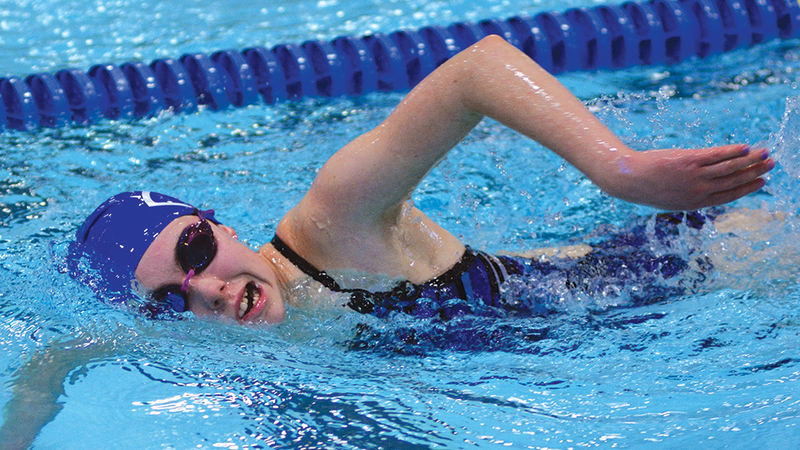 Kuch was the only McNary swimmer to qualify for the state tournament last season. Kuch swims year round at Courthouse in Salem but looks forward to the high school season. “I love the team atmosphere of it,” she said. “I love that you are constantly getting support. You’ll look from your block at the other end of the pool and you have a whole group, at every lane cheering for everyone. You don’t get that as much with club swimming.